Being tournament time in college hockey, this week’s list is heavy on the best time of the year: playoff hockey. 3/11-3/12/94 — Hosting its first CCHA playoff series since 1990, BG comes up with a sweep of Ferris State in first round action to advance to JLA for the second straight year. Brian Holzinger’s overtime goal on Saturday gives the Falcons a 3-2 win following a 3-0 shutout by Bob Petrie the night before. The two victories guarantee BG its first season over the .500 mark in four years. 3/11-3/13/77 — Mike Liut’s goaltending at top-seeded St. Louis during the CCHA playoff championship series sparks the Brown and Orange to its first of three consecutive league postseason crowns. Liut recordsa 4-0 shutout in the first game of the series and then, in a relief role, turns aside 17 of 18 Billiken shots on goal over the last 36:43 of regulation in the finale. BG hangs on to win the total-goals series, 5-4, and ends SLU’s three-year title reign thanks to Mark Wells’ marker early in the third period. 3/12-3/13/93 — BG earns a berth to Joe Louis Arena for the first time since 1990 after a 5-4, 6-3 sweep of Western Michigan on the road in first round CCHA playoff action. Jason Clark leads BG with three goals in the series, including the game winner in the deciding contest. 3/12/88 — The Falcons earn their first CCHA playoff title since the tournament was moved to Joe Louis Arena (1982) in Detroit as they top eventual NCAA champion Lake Superior, 5-3. BG goalie Paul Connell earns tournament “MVP” honors. 3/13/01 — The Falcons won their fifth-straight game, all by one goal and three in overtime, by defeating Northern Michigan on the road in the CCHA Play-In game, 2-1. The victory sent Bowling Green to the CCHA Semifinals at Joe Louis Arena in Detroit to play the No. 1-ranked team in the country, Michigan State. BGSU lost 2-1. 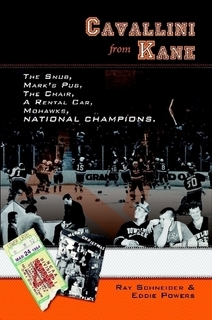 3/14/83 — The BG program and the college hockey world are stunned when the NCAA bypasses the Falcons for a tournament bid. Despite posting a 28-8-4 record, a No. 2 national ranking (WMPL), and a CCHA regular-season crown, BG is denied a chance for the national title.